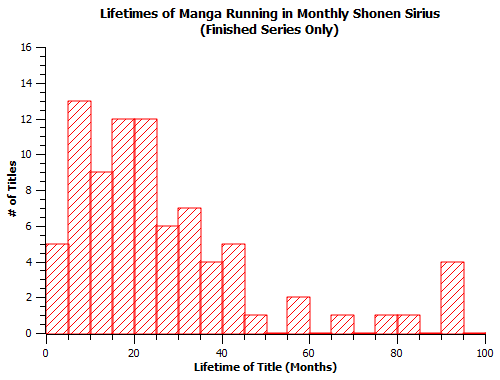 If you’re an involved fan of anime or manga, you just might have heard of Kodansha’s Monthly Shonen Sirius. It’s a small-time magazine as manga mags go, with a circulation total last reported in 2013 at 12,684 copies, but it currently hosts several titles with anime adaptations (Yozakura Quartet, Majimoji Rurumo, the current incarnation of EAT-MAN) as well as multiple titles which have recently been added to crunchyroll manga’s library (Maga-Tsuki, P4Q), so it’s at least moderately noteworthy. In recent years, this particular magazine has seen a shift in content, away from mangaka-generated series away towards spin-offs of existing franchises, which mirrors a larger trend in the modern manga industry. I’ll be taking a look at how visible that present trend is in this mag and what it means for both the lifetime of individual series and the outlook for magazine a whole. First of all, mad props to the 6 non-Aventura series that broke 90 months of runtime. I’m looking at you, Yozakura Quartet, Baroque, Shoukoku no Altair, Mako-chan no Lipcream, Yuuyami Tokkoutai, and Kaibutsu Oujo. Not like Japanese non-readers can get at the 4 in the middle, but success outside the odds always deserves props, and the histograms above show how rare it is for series in that mag to go five years, let alone seven and a half! Second of all, the currently-running sample of series is naturally smaller and runs into some noisier statistics, but its composition by age largely mirrors the finished series distribution; in both cases, the majority of series lifetimes are somewhere in the region between 0 and 40 months, with a peak at around 20 months (i.e. a little less than 2 years). 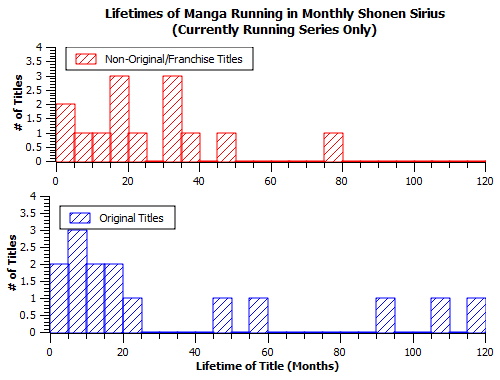 The above plots illustrate the more extreme variance of the lifetimes original manga titles; they’re more likely than their licensed counterparts to last both more than 5 years and fewer than one. By contrast, licensed manga tend to have planned few-year runs almost never exceeding four years, the sole exception being Telepathy Shojo Ran. This makes perfect sense when one considers the audience of the respective groups. Licensed products are low-risk products with a guaranteed audience, but often lack appeal to readers outside that audience. It’s hard to draw in more audience when the public at large has already had other high-budget opportunities to experience the same story. It doesn’t help that in many cases the authors stuck on these are the ones who had trouble cracking the lineup with an original product; it’s more difficult for the adaptation to surpass or even re-flavor the original work without high-grade talent on point. By contrast, every original manga represents a risk – there’s no guarantee anyone will even glance at any chapter after the first one if it doesn’t immediately grab the mag readers curious enough to flip through the entire issue, and a series pulling zero interest after three months is probably going to have a hard time putting together an audience long term. But the upside is also much higher – if a series starts strong and pulls in sufficiently good word of mouth, there’s no reason why it can’t become the next Blue Exorcist or Attack on Titan with the right anime and marketing push. I’m not a fan of licensed manga, for a couple reasons. First, it devalues the public perception of manga by putting less talented authors in more prominent positions (notable exceptions* excluded), and making it less likely that a non-fan checking out a series for the first time will respect it. Second, it takes away page space from authors who might have the skills creative juice to make a big time hit. Third, though this is admittedly debatable, I think it stifles growth for some young second-tier artists to force them into the role of a slavish adapter. Even if an author can’t write for peanuts at the start, the best way to turn a flawed talent into a polished one is to let them try things and subsequently experience failure with particular approaches. There’s one of the biggest gold stars on the records of Osamu Tezuka and Shotaro Ishinomori – it’s not just that they wrote lots of really good manga, they also just wrote *lots* of manga. Writing a lot of stuff in a short period of time can be stressful, but is an effective way for an artist to find an approach that gives them a killer punch. ** Like artistic talent, a deft hand with text just may not be there for some people, but it can often be grown with the opportunities to build a story in chunks that a serialization provides. Lastly, reliance on already-proven limited-upside titles smacks of a fear of embracing the necessary risks to stay healthy as a publisher. The oft-cited notion that the manga industry refuses to evolve is exaggerated; though the magazine model is in definite decline, the loss of profits from mags has been significantly offset since 2005 by the growth of digital manga apps like LINE manga. Publishers stick with the mag model in part because they still get results (first adapters who can provide good word of mouth) from it, and there are possible results far worse than the status quo that could result by a too-fast shift in paradigms. But the majority of readers aren’t exactly chomping at the bit for content that’s derivative and rehashed. A reasonably competent staff can and should do better than a magazine that’s half ads and fanservice for non-native franchises. 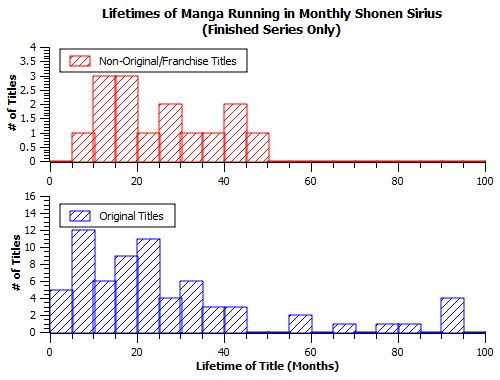 Monthly Shonen Sirius is hardly alone in the camp of magazines now offering franchises not their own as a rising percentage of their total content. Monthly Comic Blade of Aria fame, whose first three years saw the mag run a grand total of one licensed title, now plays host to adaptations of Robotics Notes, M3, Grisaia no Kajitsu, and Psycho-Pass within its lineup of 23 non-irregular series. It’d be a daunting project to quantify just how much more prominent manga adaptations of non-manga material have become over the past decade, but it would also, I think, be an interesting one. The manga industry will continue to evolve, and the recent increased dependence on non-manga source material is one thing I hope we can phase out, or at least try to improve upon (both in terms of the commercial upside and developmental benefits for authors they offer), as the post-Shin Takarajima years*** continue to stack up for the for the manga industry. *Thinking of a particular collection of consecutive full-page spreads in a Higurashi series adaptation and a decision to split a block of exposition on scenery into like a dozen dialogue panels in Takako Shimura’s take on Route 225 as I write this. **Especially drawing multiple series in different genres simultaneously the way N. Urasawa, N. Fukumoto, A. Mitsuru (who *tied himself* for the Shogakukan Manga Award while doing both Touch and Miyuki) and many other greats did at the peaks of their careers. Takako Shimura’s career narrative is a fun and traceable example. Follow the level of her character art and deliberately chosen storyboard patterns. She goes from doing unremarkable adult manga under pseudonyms in the mid-90s to doing a serial for minor mag Comic Beam in the late 90s to doing three serials at once in the early aughts before starting to focus on the projects she’s become known for. The progression through each step is profound, by the time she swaps Dounikanaru Hibi and Love Buzz for Aoi Hana in late 2004, she’s a scary sharp black belt with steel-cut purposeful storyboards and an soft, profoundly sensitive artstyle ready to take on the world. I’m not confident we see a lot of her best work if she doesn’t have the chance to develop under those circumstances. ***68th anniversary of the landmark 1947 Tezuka title is coming up soon! Kind of amazing how short the history of modern manga is compared to how much it’s accomplished in its short lifespan. 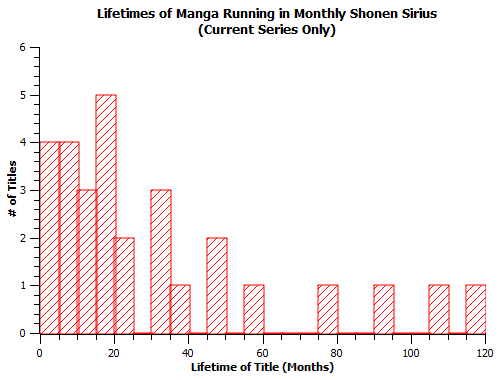 This entry was posted in Articles, Fun With Numbers and tagged Fun With Numbers, Manga, Monthly Shonen Sirius by torisunanohokori. Bookmark the permalink. In the 2011 interview you linked, Ken Akamatsu talked about how the manga industry faced a potential industry as the traditional model of discovering new talent broke down. with circulation numbers and editorial staff were both shrinking, he theorized the industry can reduce financial risk of picking up promising rookies by pairing them with existing IPs (the “comic model”). I guess what you’re seeing now is that exact theory playing out, with some unfortunate consequences. Personally, I’m less intolerant of licensed manga. When the alternative was the catastrophe Akamatsu envisioned, it feels like the lesser of two evils. Last decade, we saw many mangaka begun their career in the doujin market. Licensed work might be a similar sort of evolution. -Takako Shimura (Route 225) was successful beforehand, having already started Aoi Hana a good 3 years before this adaptation. -Nozawa Beam (Realize, Kaidan to Odorou) hasn’t put out any tanks aside from the ones in those two series. -Nikaido Hikaru (Eulenspiegel) is still a journeyman and has bounced around to work for Mag Garden and Shogakukan since that finished. -Iida Toshitsugu (Telepathy Shojo Ran) hasn’t done any professional manga since the adaptation finished in 2009. -Soga Shiina (Seikoku no Altair-san) has continued working on licensed manga, including some Vocaloid oneshots and most recently Gakuen Psycho-Pass. -Kuramoto Kaya (Jyuhime -Phantom Pain-) has gone back to illustrating novels since the adaptation concluded last May. It may provide some short term security, but it doesn’t serve as an effective means of career advancement for the people working on it, which is a lot more important to both artists and the industry in the long run. ICHIMONJI Kei (Gun Princess – Sincerely Night) is currently serialized in Comic Ryu with Ninniku Knuckle. AZUMA Kyoutarou (Sacred Seven) works on Sakura Brigade, one of manga you count as running originals on MSS. RENJOUJI Mei (Rose Gun Days) currently draws Ebisu Gakuen Sunday Class Detectives for Manga Box. None of them are burning up the sales chart, of course, but some did went on to work on original stories. I don’t know how 3 out of 14 (or less, depend on whether veterans like Takako Shimura) compares with the churn rate for rookies that debut traditionally. Might be worth looking into, actually. I guess I made assumptions about the reliability of Japanese wikipedia there that weren’t really valid. : P They were so good with tracking timeslots, though. Off the cuff, that sounds like it’d at least be closer to the normal rate of continuation for artists with at least one year-long serial. Splitting artists up into different tiers of success could alter the answer a bit – it’s sort of hard to take borderline cases and go binary yes/no on them. However, with this little official information available (not being on the MSS page is a big red flag), I would lean towards thinking that it’s gone the way of Bouken Ou Beet and, while not officially cancelled, is probably never going back to a regular serialization. Do you know why it’s on hiatus in the first place? Is the mangaka ill like Bouken ou Beet? Or the manga is too hard to draw monthly because it is very detailed?